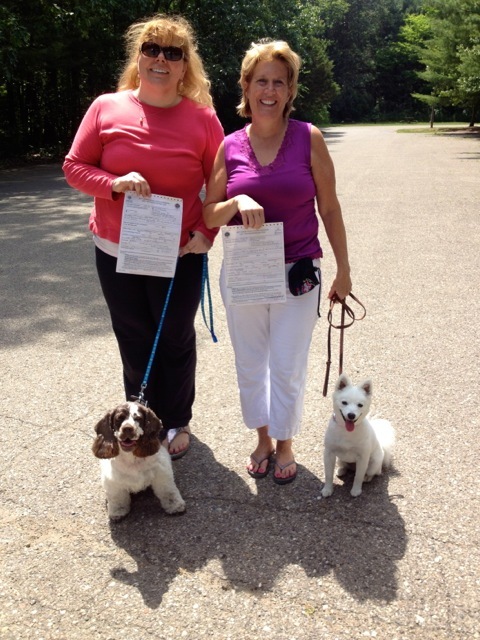 On June 24, 2012, two dogs from the Remote Manners dog training class taught by Michigan Dog Trainer passed the American Kennel Club’s (AKC) Canine Good Citizen (CGC) test. The test was held at Proud Lake Recreational Area near Wixom, Michigan. 2. Rhonda Hennessy and her dog Sarah, American Eskimo of Linden, Michigan. This entry was posted in CGC Stars, Uncategorized and tagged AKC, American Eskimo, American Kennel Club, Canine Good Citizen, CGC, Cocker Spaniel, dog, dog training, Farmington Hills, Linden, Michigan, Michigan Dog Trainer. Bookmark the permalink.